On Tuesday's Good Morning America, Diane Sawyer complained about America's maternity leave policies for women, and for the fourth time in slightly more than two years, the show connected them to such struggling countries as Swaziland and Papua New Guinea. The host solemnly observed that only three countries "have policies equal to the United States. Swaziland, Liberia and Papua New Guinea." Sawyer, who was introducing a segment on how women are afraid to take much maternity leave during the recession, derided, "Even in Iraq, women get one year of leave, six months at full pay, and six months of half pay." Linking the U.S. to such poor countries was, perhaps, intended to horrify viewers. However, the ABC anchor left out some key stats, such as the fact that nations mandating paid maternity leave, such as Germany, often also have high unemployment rates. As for the countries Sawyer mentioned, Swaziland also has an unemployment rate of 40 percent, an infant mortality rate of 70 percent and a life expectancy of 32. Papua New Guinea's unemployment rate is up to 80 percent in some urban areas. So, there seems to be some differences between America and these countries. As noted earlier, this is the fourth time in two years that the ABC morning show has connected America to Swaziland, among others. On September 28, 2007, co-host Robin Roberts fretted, "Did you know that among 173 countries surveyed, there are only five countries without a national maternity leave? Lesotho, Swaziland, New Guinea, Liberia and the U.S."
DAVID WRIGHT: A recent Harvard-McGill study of more than 170 countries found that only four of them do not require paid leave for new mothers: Liberia, Papua New Guinea, Swaziland, and the U.S.
ELIZABETH VARGAS: In fact, a study out this week from Harvard and McGill University, shows that of 173 countries surveyed, only five provide no form of paid maternity leave: Papua New Guinea, Lesotho, Swaziland, Liberia, and the United States. During the June 16 segment, reporter Kate Snow offered no dissenting voice what the cost of companies providing more paid leave might be. Instead, she featured only clips from Ellen Galinsky, the co-founder of the Families and Work Institute and Carol Evans, the founder of Working Mother Media. See the April 20, 2001 CyberAlert for more examples of ABC's promotion of paid leave. DIANE SAWYER: Our new series, "the new normal" explores how we live in the wake of the recession. And today, we're going to look at maternity leave. There are only three countries in the world, according to many study groups, that have policies equal to the United States. Swaziland, Liberia and Papua New Guinea. Even in Iraq, women get one year of leave, six months at full pay, and six months of half pay. And so many other countries, particularly industrialized nations, offer similarly generous benefits for women who are taking maternity leave. But "the new normal" in America finds some American women afraid of taking any leave at all. Wondering if their jobs will be there when they're ready to come back. And here is Kate Snow. KATE SNOW: In California, Kristen Carter is preparing the nursery. In New York, Michelle Papachristou is home with eight-week-old Nina. Two women who have never met, with strikingly similar stories. Michelle had planned on taking nine months from her job as a flight attendant, most of it unpaid, the same way she did with her first born. After trying to get pregnant for a year, Kristen was hoping it would be six months before she would need to return full time to her college teaching position. KRISTEN CARTER: I get pregnant and then it was almost immediately that they, like, started slowing things down at my husband's job. And then, they started having less course offerings at the college I teach at. And then it just all sort of all fell apart. MICHELLE PAPACHRISTOU: And then in January, my husband's company announced that everyone was getting a 10 percent pay cut, across the board, permanent. So, we really had to rethink how long I can stay out of work. SNOW: Instead of nine months, Michelle will stay home about four. Instead of six months, Kristen will take six weeks. CARTER: The longer that I'm away from work, the more I'm worried that they're going to discover that, hey, maybe we don't really need her. Maybe we've have got other people that could teach those classes. They're not trying to squeeze me out or anything like that. This is not a reflection on them. It's just the economy and the way of the world. SNOW: In an informal online questionnaire by Working Mother magazine, about one-third of respondents said the recession was impacting their decision in taking maternity leave. ELLEN GALINSKY (Pres, co-founder, Families and Work Institute): The issue for women these days is they are increasingly important financial supporters of their family. SNOW: Maternity policies vary by employer. But by law, any company with more than 50 workers is supposed to offer 12 weeks of unpaid leave. 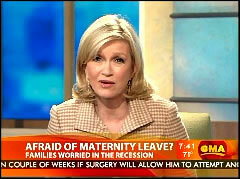 CAROL EVANS (Founder/CEO, Working Mother Media): Women are starting to be afraid to take their maternity leave. They're afraid of not being in the office, immediately after having a child, it seems. Women should be fighting. They should be doing the opposite of feeling afraid. They should be fighting this fear. SNOW: And it's not just fear. Both Kristen and Michelle say they feel guilty about taking less time. PAPACHRISTOU: I just feel like I'm cheating her a little bit, out of time that I thought I was going to have to spend with her. CARTER: I'm really afraid that I'm going to miss out on the milestones. The little things. Like the first smile, and the first step, and the first word. You know, I'm just going to cry if someone else is there for that and I'm not. SNOW: The worries are right there under the surface. But Kristen is trying to keep things in perspective. CARTER: I'm really optimistic about our future as a family. And money can be sorted out. If we have a healthy baby, I'm happy.